Your dogs are a part of your family and like any family member, you’re responsible for loving and feeding them, as well as keeping them safe and secure at all times-both indoors and out. Plastic pet IDs are an easy, fun, and affordable way to identify your dog and ensure their safe return in case they wander away. 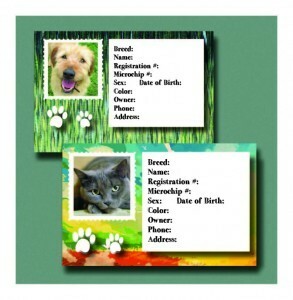 With unlimited colors and design options, you can customize your plastic ID tag to fit your dog’s unique personality.